Last night Darren treated Stu and I to a meal in town and Matilda The Musical at the Cambridge Theatre in London's glitzy West End. The show was written by Dennis Kelly and the rather fabulous Tim Minchin and commissioned by the Royal Shakespeare Company. The stage version has been hailed by one critic as "the best British musical since Billy Elliot." And I'm inclined to agree. 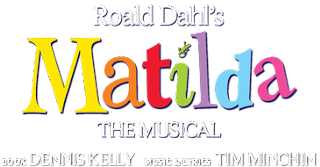 Matilda tells the story of a bullied little girl, unloved and despised by her parents who attends the horrific Crunchem Hall Primary School. There she is further bullied by an ogre of a headmistress Miss Agnetha Trunchbull. Things come to a head when Matilda discovers she has psychokinetic powers and uses them to reveal a secret and force Trunchbull out. It's a kids story sure but it also covers child abuse, death, suicide and mental cruelty on it's journey to enlightenment. The kids in it are great, the set perfectly fits the story and the songs are as witty as they are catchy. May it run and run.